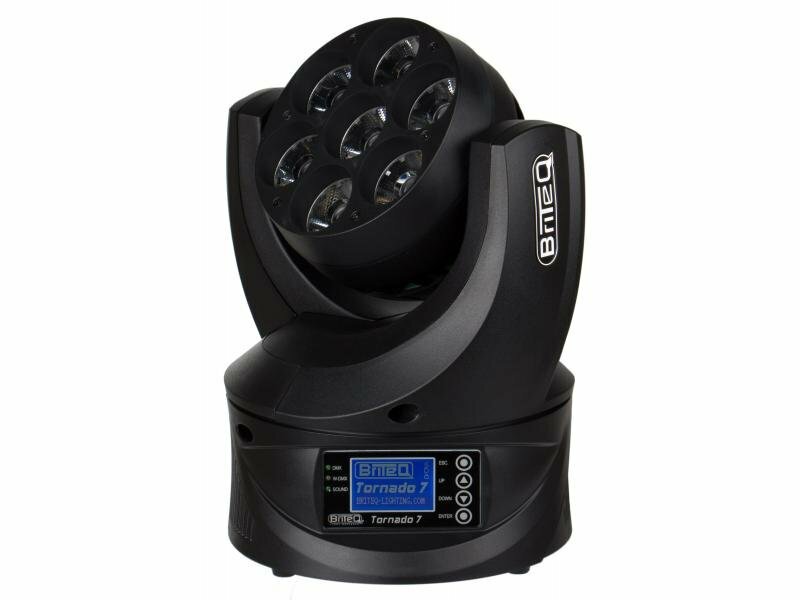 High speed ENDLESS ROTATION pan/tilt movements with 16bit resolution and automatic X/Y re-positioning for amazingly dynamic show programming. Very bright 6° beam for maximum “beam effect" impact. The 7pcs Osram® “OSTAR" 4in1 RGBW 15W leds with 4 zone pixel control! Different preprogrammed color effects for fast show programming. Precise dimmer with perfect color consistency over the complete dimmer range, down to zero output. The multi-processor design assures enough processor capacity, even for the most demanding situations. Automatic and sound controlled working modes, both in standalone and master/slave mode. User programmable 16 scenes memory for standalone operation. The Matrix LCD-display, combined with touch buttons assure easy navigation in the different setup menus. Multilingual setup menu: English, French.